It's late October and our Portland rains have returned in full force. Some of you who know me are aware that I suffer this seasonal change with little grace or enthusiasm. But this week my eye has turned to a plant that flourishes in this autumnal wetness. And unlike me, it looks gorgeous splashed all over with raindrops. I give you Mahonia repens. We have a number of these Northwest natives in the garden here at Longview Ranch. Here, one snuggles in with some Pacific Coast Iris, and a Beach Daisy. Pine duff shows off their gleaming green foliage perfectly. I don't get the credit for my favorite plant this week, because they're in the Northwest Territory of our garden, master-planned by the Mulch Man. Their inclusion is his choice and I couldn't be happier about it. 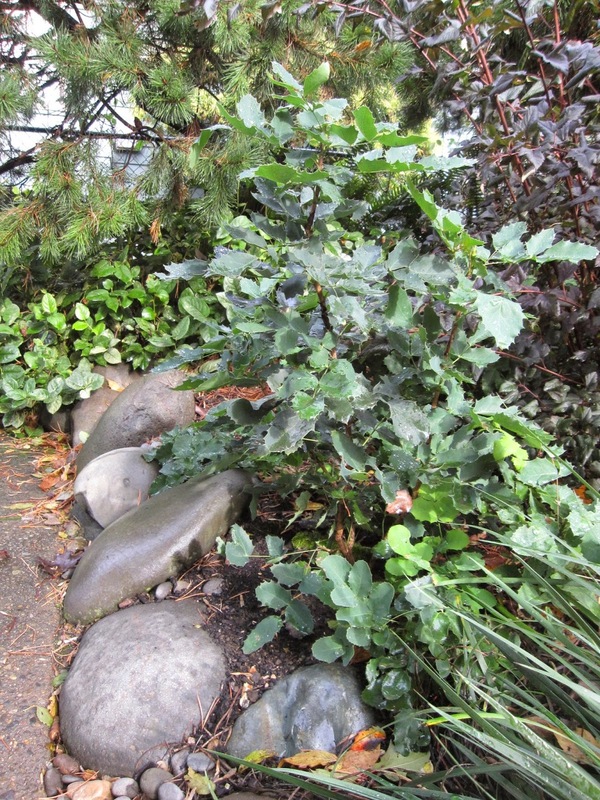 But I'll confess, the first time I saw Mahonia repens, I was less than overwhelmed. 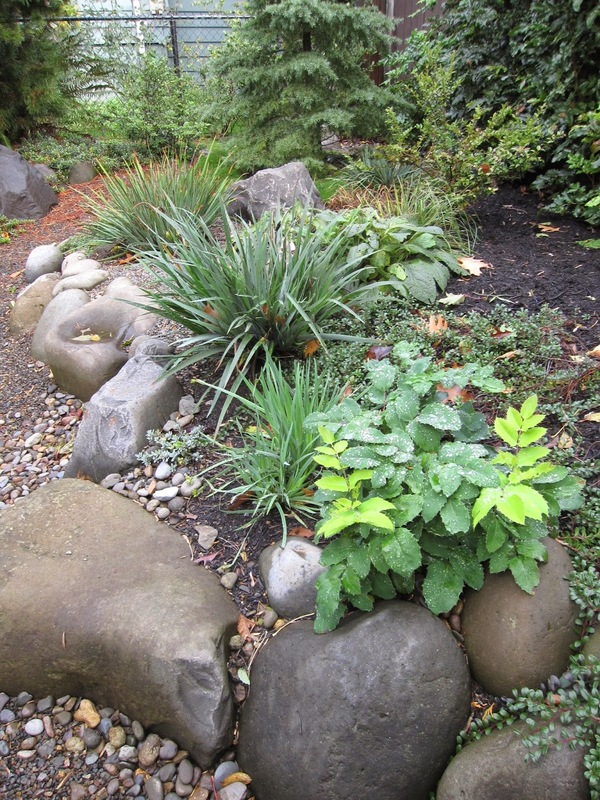 A dusty, parched area of the Oregon Garden held a number of PNW natives, and although their M. repens seemed to be surviving, they weren't stellar examples. But in our much smaller garden, a trickle of summer water and a little judicious pruning has paid off. What's more, these plants are looking like it's spring in the middle of October. And they've put on this beautiful fresh growth all year long. There's just the faintest blush of red on some of the new growth. Like most Mahonia, these have the characteristic bunches of small, yellow flowers with blue berries that follow. Here's a picture of the blossom from this past March. Yes, it was wet then, too. In several inhospitable locations in the garden, these Northwest natives have been surprisingly unfazed by scorching late afternoon sun. The occasional brilliant red leaf has been the only sign of any stress. I'm joining with danger garden this week to share this favorite plant. Check the comments there for more plants that are catching garden bloggers' eyes in late October. I've been on a bit of a blogging hiatus, and for the first time in years I even missed last month's GBBD. I'm not sure just what happened - day after day went by and apparently my garden just wasn't inspiring me enough to blog about in those hot, dry days of September and early October. Or maybe I was just having too much fun in real life. Anyway, now that the rains have decidedly returned, I plan to be a bit more regular. So I'll start with the few flowers I have for this month's Bloom Day. Every year Salvia guaranitica 'Black & Blue' looks so wimpy and takes so long to bloom that I swear I'm taking it out. Then along comes that bewitching color combination and I'm enthralled once again. This year it's been particularly striking backed by Pennisetum rubrum. Punica granatum 'True Dwarf' took a mid-summer break from blooming but came back again in September and has been blooming ever since. Do you suppose that was because I watered it? Phygelius 'Passionate' feeds the hummingbirds after everything else they love is over. I love its dark orange flowers and reddish leaves so much that I bought another plant when I found it at Windmill Gardens in Sumner, WA, two weekends ago. That 75% reduction in price didn't hurt, either. Agastache 'Acapulco Orange' is seemingly back from the dead: a happy volunteer seedling from the dear-departed mother plant is now gracing Longview Ranch. I couldn't be happier! Rosa 'Sally Holmes' is a little rain weary, but I had to include this shot: most of my flowers are small or quiet which makes 'Sally Holmes' the showiest blooms in the garden this month. Hakonechloa macra has pretty light red seedheads that match its reddish autumnal stripes. Erigeron glaucus just blooms on and on. This Penstemon is on its third bloom phase. I can't ever get the minute flower/seeds of Persicaria 'Lance Corporal' in focus! Our new Berberis verruculosa are sending out a few little bright yellow blooms. Check out those handsome thorns, too! 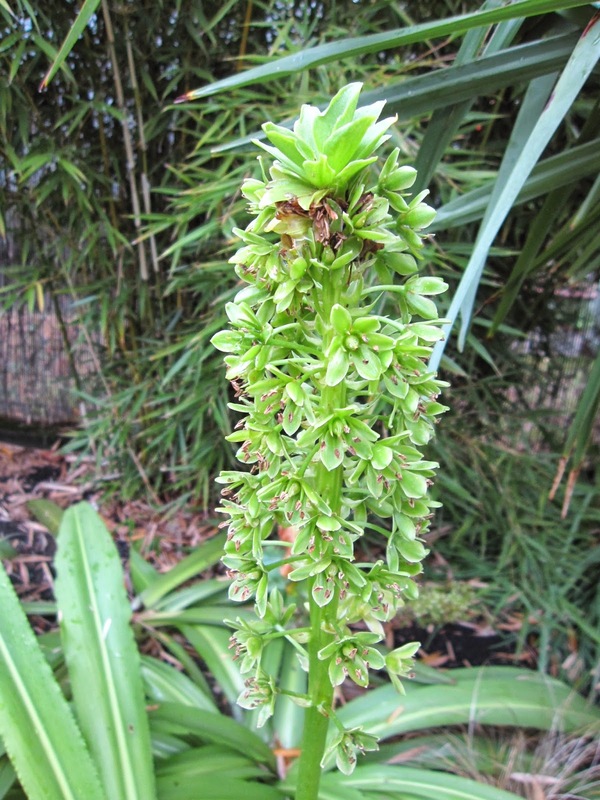 Eucomis pole-evansii gets honorable mention this month for its resolutely upright bloom spike. This one has never been staked and is still standing tall. Last today is a Streptocarpus I've had for at least twenty years. Re-potting by the Mulch Man and a summer vacation on the patio was the secret to these beautiful, rich blue blooms. Bloom Day is generously hosted each month by Carol Michel of May Dreams Gardens. Click over there to see more October flowers. To participate just visit her site, upload your blog post there, and then add a link to it on your own post.